Is there a better alternative to PolyRootsRB? Is PolyRootsRB really the best app in Applications category? Will PolyRootsRB work good on macOS 10.13.4? 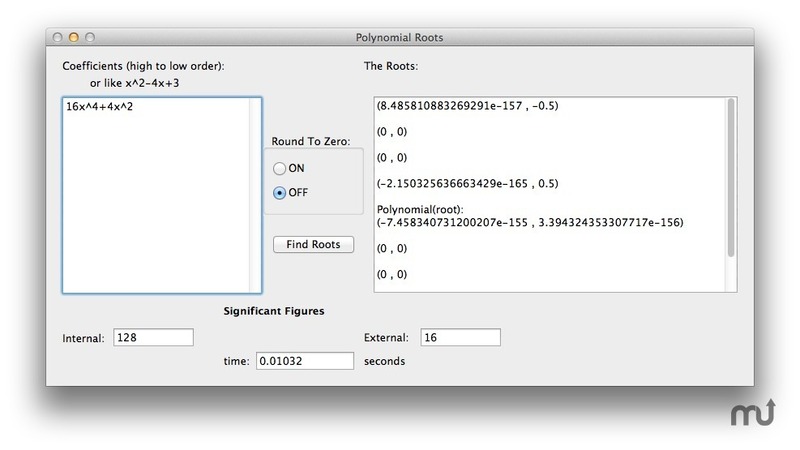 PolyRootsRB finds the roots of a polynomial to any chosen accuracy using Laguerre's Method. The coefficients of the polynomial can be real or complex. Allows the analysis of some x-based polynomials copied from the internet by PolyRootsRB filtering out spaces, *'s, 's, and the ASCII for CR and LF for such x-based polynomials. PolyRootsRB needs a review. Be the first to review this app and get the discussion started! PolyRootsRB needs a rating. Be the first to rate this app and get the discussion started!